Somewhere along the way, I traded the scraps of paper that litter my life for a brand new notebook. No longer thoughts left trailing the parade of me, discarded confetti collected as an act of sanitation (likely again discarded, permanently, another act of sanitation). Instead there’s a brand new notebook, an object of singular purpose and identity, a staying place for thoughts along that Way. Something to keep, to refer to, to hold and recite from. Yes, a brand new notebook: from the hopscotch squares of paper scraps I jump into the order and collection of pages, their memory and sense of being. My musings. I fill it with words from my favorite pen, fountain-tipped and spewing the able rush of a water-based ink to catch the speed of thinking. The notebook fills and I have it to prove a mind’s wondering. Catch it in the rain, the paragraphs dance. That’s the price of this ink. Some words magnify, some blear. I am not ready to give up the ink’s slide whisper, the bright blue for this plop of fate, for accident. The ink is a companion, a confidant. It guides me as I guide it. Rainworn, I can still make out where I have been, paragraph by paragraph, rebuild the meaning of me out of the blurred abstraction of already bad handwriting. I wear old habits. Like the scraps of paper, the notebook goes into pockets, gets left on desks, sits on the front ledge of a bookshelf. Some of the paper scraps I still find. Some I find hiding in closets. Some in pockets of clothes seasons on. Some in the long dark space of a drawer, old boxes. 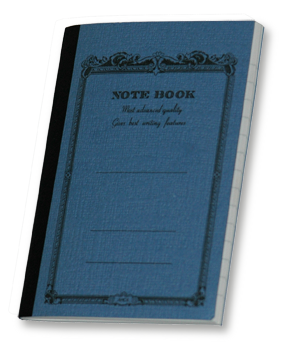 I find the notebook, again, too; it is easier being a single thing brightly colored with a smart cover. It seems to want to be found, to be used. Paper scraps would clump and remold, making it through the wash. They became sculpture, a testament to process, to error. Document and meaning becoming just shape, a wad. Past capability is only notion, the once-upon-a-time of words – gone. It wasn’t so bad to lose them in this way. It offers a kind of warning, a suggestion to pay closer attention to happenstance, they having been a holder of mine. Once in a while, the notebook finds its way through the wash. Well made, out it comes still holding the shape of itself, page after page white and fresh, a kind of reincarnation to day one. A brand new notebook eager to hold the shape, the depth, the memory of words. This entry was posted in Observation. Bookmark the permalink.